Have you heard much about Mile Marker American winch producer? Don’t know which model to pick? Have a closer look at the electric winch for trucks and SUV – Mile Marker 77-50141 W SEC8(es) with the 8000 lbs. This winch is one more evidence of the fact that this brand uses innovative approach to the creation of the smart products, which you can rely on in any situation. Let’s find out whether the winch made by Mile Marker is exactly what you are looking for. 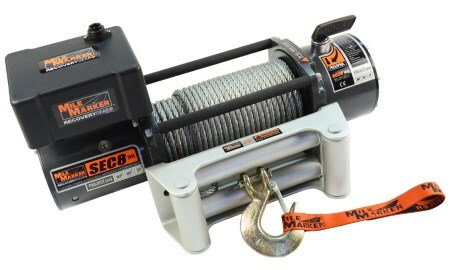 Mile Marker winch of the reviewed model has a pulling power of 8000 lbs. It is a fast winch that can provide you with the top quality recovery. It can be used not only for the off-road adventures but also for certain industry needs. It has a wound motor, which guarantees the smooth operation. This winch is equipped with the best quality parts, among which is the roller fairlead with the famous Dacromet coating. The winch is resistant to any weather conditions. Where else will you find a winch that is waterproof, mud proof and snow proof? This model has a sealed element that corresponds to IP68 standard. The body of the winch is made of metal, which is the guarantee of the product durability and reliability. These features are also provided thanks to the 3-Stage Planetary Gear with the ratio 152:1. Among the features that are worth attention is the solenoid 500-amp. It provides a maximum duty cycle. You will be glad to find out that the winch has a handheld remote control with a 12′ cord. The winch parts are all made of the top quality materials and are designed in accordance with the latest trends and high-technological solutions. Is Mile Marker 77-50141W the Best Option for You to Pick? If you are an experienced off-road driver, you will definitely see the advantages of this winch model presented by the trusted American brand. It is aimed at being used by enthusiasts who like exploring new terrains but at the same time safety is their main priority. If you are a beginner and it is the first winch purchase, don’t worry as it is easy to use. It will serve you for years never letting you down. This product is a great choice for Jeep and truck drivers who can’t imagine their life without extreme. The winch producer offers a 2-Year Warranty, which means you have nothing to worry about. During this period of time, you have the right to get the professional consultation concerning the winch performance. If you want the best winch for your vehicle, consider this model. There is no such a driver who won’t like the black metal coating that looks stylish and guarantees the durable winch operation. I have got Mile Marker winch to install on my ARB 3423020 bumper. It fits it perfect. The process of installation didn’t take me long. I enjoy the speedy performance of the winch and I can claim that it is worth its money. To my mind, this is one of the best models presented by Mile Marker in the series of the waterproof winches. I used it last weekend and I was completely satisfied with the recovery. The weather was horrible, snowy and stormy but the winch coped with everything successfully. Recommend it!